You all know the song, right? My first run through my neighborhood – wait – it’s not a neighborhood. Let’s get one thing straight. I have been running throughout 1,500 acres of my family’s farmland the past four months. My God. These hills at home are so much steeper than I remember! Small mountains are a better way to describe them. Anyway, my first run was two miles. From my house down the windy, and of course, hilly, country road to my grandmother’s is exactly one mile. So, I went down and back. Sounds simple. Nope—it’s a constant decline so mile one was a cakewalk. Mile two… Ugh, mile two. Well, I did not run the whole way back. In fact, I walked most of it, and was very frustrated, not to mention, DEAD TIRED. Call it what you want…. Desire…Pride….Ambition…Cows. HA! It was the cows that got me. About one month into my training, I was coming up that dreadful mile incline (although this time is was mile six). I noticed that a bunch of cattle were right up against the barb-wired fence, about 20 feet from me. I kept the strides steady but, I’m not going to lie, I really didn’t think those four skinny wires were enough to hold the cows back from coming right at me. Suddenly, they took a quick, hard turn and they were running parallel to me, right beside me. I hit pause on my iPod and just listened. The stomping grew more intense and much louder. I turned to look behind me – behind them – and about 150 head of cattle are following their leaders. They are running with me up the hellish hill and they don’t stop until the top. At at that moment, I knew this was the place for me to be training. Week after week I got stronger and faster on those darn hills. Week after week I ran alongside my friends in the field and learned to appreciate this beautiful land. Throughout my training I have seen some of the most striking sunrises and sunsets; I have run through thunderstorms (literally) and fog; I have heard birds singing and coyotes screaming; I have smelled beautiful flowers and fresh manure. Okay, the manure isn’t that lovely but you get the picture. Over the past four months, I have also had to train in other places due to my travels – two that stand out are Des Moines, Iowa and New York City. I did 19 miles in Des Moines. Can we say F-L-A-T (and no offense to the city but, BORING)?! 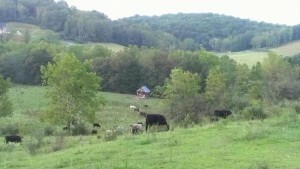 Quite frankly, I could not wait to get back to my moo-ing friends and their hills. I did a 21-miler in New York City most recently. Actually, I incorporated the last half of the marathon route into this long run. It was awesome to run this city since I hadn’t done so for many months. However, I kinda felt guilty humming the lyrics to Frank’s Sinatra’s New York New York. I felt like I was cheating on my mountains…and the cows. I am now less than seven weeks away from Marathon Sunday. I know that I will have a positive marathon run because I learned, over the past months, to trust my surroundings, my body and my mind. I learned that the perception of something so “big” (whether it weighs 1,000 pounds or it is 26.2 miles long) – can be deceiving and intimidating to anyone. Don’t let that discourage you from conquering it. Have fun. Keep the faith. Run with the cows.